“I travel not to go anywhere, but to go. I travel for travel's sake. The great affair is to move.”― Robert Louis Stevenson. Ever since Volvo launched their fleet of luxury buses in India, it has transformed the way we travel. Bus journeys are no longer tiresome and hectic. The comfort and safety levels of these buses are no match and its competitors are now making inroads into this highly dominated market. However for a change, I decided to try something different for my journey to Mumbai. The demand for sleeper buses rose substantially and almost all operators started to induct sleeper buses on this stretch. Having tried Volvo sleepers on multiple occasions, this time I decided to try something different. Did I make the right decision? Read on..
Few weeks before my journey to Mumbai was being finalized, my friends were making plans of driving to Mumbai. But I had decided not to be a part of the crazy venture and as usual decided to search for buses. 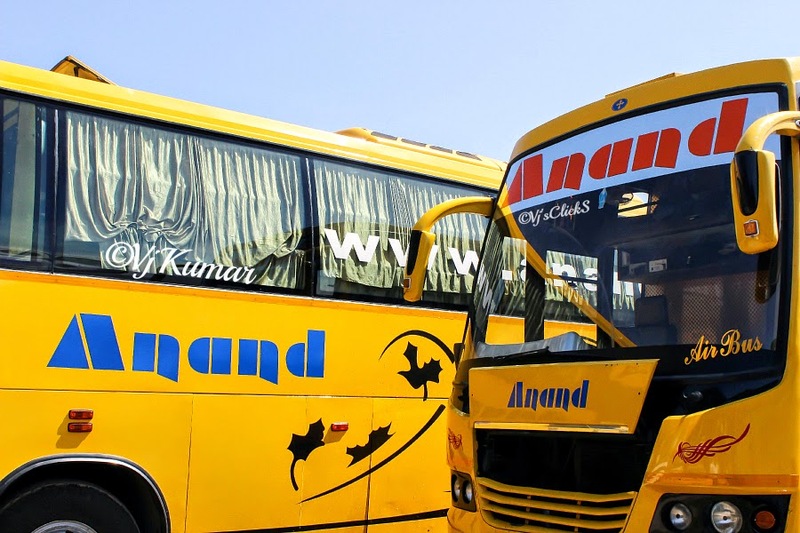 Having heard many reviews about Anand and Sharma sleeper buses (Leyland), it was a very difficult choice to choose. After a lot of thinking, I decided to book the 17:00hrs Anand Sleeper from Bangalore. I booked the last row upper berth as it was the only single berth available. Knowing the Mangalore based operators, I decided to reach the pickup point way ahead of my scheduled time to avoid any last minutes hiccups. And as I anticipated, the bus arrived almost 25mins before its scheduled time. The pickup man called me up informing me the exact location to the bus. 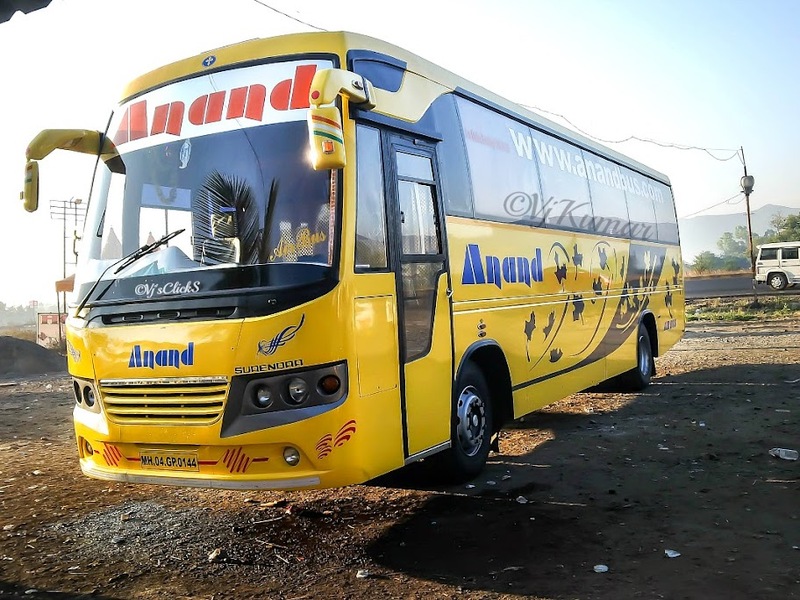 Anand recently inducted new set of Surendra built buses and this one was from the newest lot. I was very excited to see the same and boarded the bus. The bus was very well maintained and the biggest advantages of these buses which I like the most are the berth which comes with back rest so that passengers can sit comfortably in their berths. Plastic covers on few of these berths were not yet removed. I made my way to the last row and climbed into my berth. The berth was spacious enough and with the a/c was already set to optimum. The bus began to move immediately and headed towards Madiwala. I settled down in the bus and hooked up my cellphone to plug point to check if the same works and to my surprise it did. Meanwhile we had finished picking up passengers in madiwala and headed towards BTM layout for our next pick up. The heavy traffic was making it difficult however the passengers boarding at the point was on time and we quickly made our way out. The boarding continued along making its way towards Jayanagar, the ever crowded Kalasipalya and then headed towards Railway station. Lot of time was being eaten up at these pickup points as couple of passengers were taking their sweet time bidding good bye to their loved ones while other were making a fuss while loading the luggage in the bay. We finally pulled over at Anand rao circle and the wait for the parcels and pick up continued. After wasting a good 25minutes, we finally moved on heading towards Hotel Amar. After picking up a lone passenger we moved ahead. We crawled through the Sampige Road and with bumper to bumper traffic which showed no respite. I remember passing by Malleshwaram Police station after which I dozed off. When I woke up we were at the Nelamangala Toll and after passing through the same we pulled over for our first fuel stop. The stop was brief and then the real action started. No sooner we rejoined the highway; the driver decided to flex his muscle and pushed the pedal to the metal. The bus was easily doing 3 digit speeds overtaking anything that lay in its path. Even a B9R was no match as it overtook it from the right putting the Volvo to shame. While the action outside was overwhelming, the ride inside was slightly different. With every bump the bus ran on, the passengers at the rear suffered the brunt. This was when I missed the comfort of Volvos. The driver showed no mercy to any slow moving vehicles as he floored the bus towards Mumbai. After watching the action unfold for few minutes, I decided to get some sleep as I had a long and tiring day up ahead. The bus reached the regular Aroma hotel after Sira and pulled over for the Dinner break. I decided to continue my sleep, and after a brief halt we resumed our journey. While we began to head out the restaurant, a SRS B9R entered for its journey. The bus was constantly doing good speeds and at around 1am I woke up to find the bus passing the VRL Logistics in Varur. We passed by the toll and pulled over for a quick bio break. The stop was short and we resumed our journey and so did me with my sleep. I was woken up again when the bus went on speed breaker at high speed only to find we had entered Belgaum. We pulled over for yet another fuel stop and passengers decided to take another bio break. This time the break was for long and just as we began to head out of the Fuel bunk, the pairing bus heading towards Bangalore pulled in. With all set, we rejoined the highway and I decided to get some shut eyes. 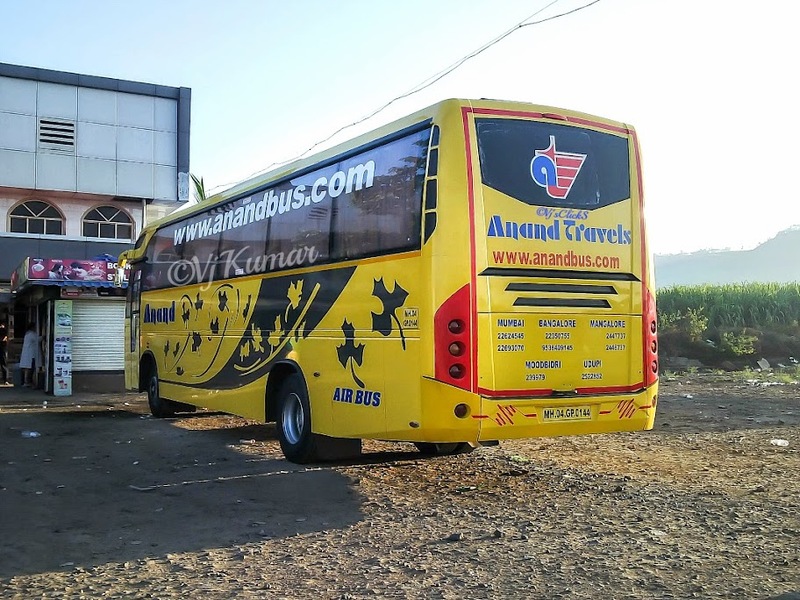 Yet again I woke up with a loud bang, thanks to the driver driving fast on a rough patch; I found the bus deviating from the highway near Karad. Here we dropped off a passenger and parcels and rejoined the highway. The a/c inside the bus ensured passengers cuddle in the thin blankets provided. We headed towards Satara and the bus was now driven at an optimal speed. We finally pulled over at the Hotel Neelkamal, marking our last break for the journey. As always, an ample amount of time was given for passengers to freshen up. We resumed our journey again and so did the speeds we were doing. We headed towards Wonder City, Katraj to drop off Pune bound passengers. Around 8-10 passengers alighted here and soon we headed back towards the highway heading towards the Mumbai-Pune Expressway. The driver again flexed his muscle overtaking Shivneri buses which were also doing good speeds. The bus handled the Lonavala section so very well that it could easily put an F1 car to shame. I decided to take a quick nap while another comedy flick on the screens kept the passengers entertained. I decided to take a quick nap while another comedy flick on the screens kept the passengers entertained. Traffic was relatively moderate when we reached Panvel, however intensified as we headed further. The Vashi toll was crowded and this was the first time I encountered such traffic as I entered Mumbai. Since my journey was coming to an end at Chembur, I packed up my stuff and headed to the front. I was dropped off at Chembur at 11:15am. Will I try this service again..?? This was one of the fastest journeys I have undertaken till date. 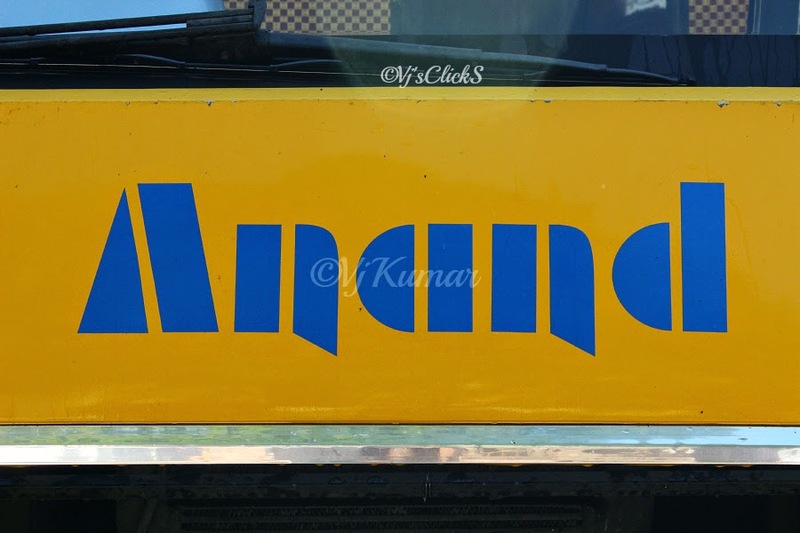 The bus took 18.5hrs to reach Chembur (Mumbai) from Kormangala (Bangalore). The bus is very comfortable however the last row ride is not. I would rather prefer a Volvo Sleeper if it is a last row ride. Also, I feel they should arrange a pickup bus which is easier to pick up passengers across the city as maneuvering the big bus through the traffic filled streets of Bangalore is a daunting task. Full marks to the crew who were friendly and cooperative towards passengers all through the journey. I will certainly try this service again. Was this a 2+1 A/c Sleeper bus? And did the 2 seats (of the 2+1 combination) have no partition? Also, what about privacy? Were the seats covered through some curtains/doors/sliders? This is a significant well-known sort of Air conditioner system with two units, inside and outside. This sort permits Split Air Conditioners to be introduced with no requirement for a window or an open spit in the divider. AC repair in Hyderabad . It could be effectively AC repair in Hyderabad fitted anyplace in the room and is rich looking Split Air Conditioner review list 2017 and possesses a great deal less space than the window AC. Your Blog is very good and give unique information. I really like this blog. Bharat Taxi is to provide Cab Booking In Mumbai . Thanks for the effective information about. If you have any requirements for tempo traveller rental in India then you can book through our website. Its an awesome, appropriate, customized information. It truly is definitely excellent post. I am really very pleased to check out your website. Really this is a great post. Such a fascinating and insightful. Really this is a great post. If you plan to go trip then the cab booking is really most important part of your trip. You can get easy, comfortable and inexpensive taxi services with professional drivers in all over India. We are also providing tourist vehicles for your journey. Book cab from our various options and let us make your holiday a moment to always remember. For more details visit our sites:- Car Rental Services in Mumbai. Very informative information within the blog. Keep it up! 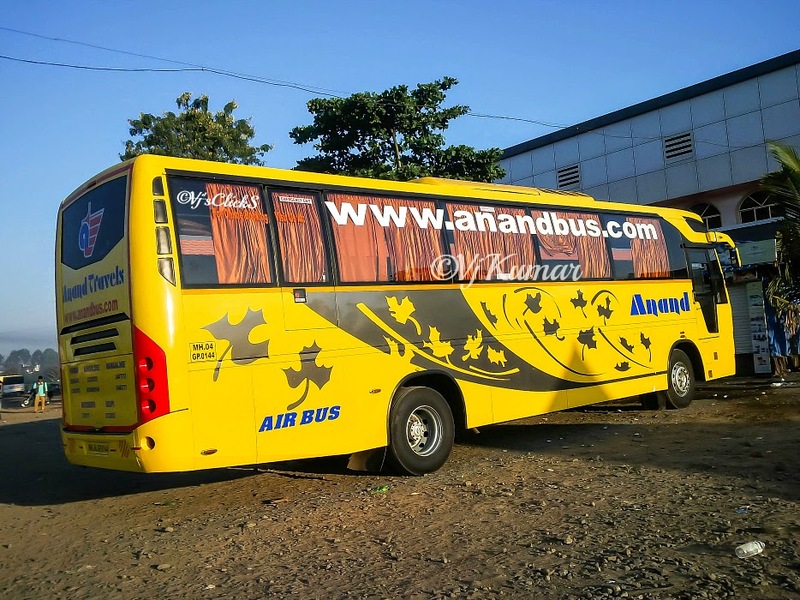 Bus Rental India offers Delhi to outstation Bus Rental Delhi services at cheapest rates. Thanks to share such nice piece of information, however we at KeyVendors also deals in AC repair service in Delhi, so feel relax to contact us for any further query for AC related service in future , we will happy to help you. I have seen your blog and this post is very informative for me. Good blog post with nice pictures. Thanks for the sharing us! Have a look at Bus on Hire in Delhi for outstation trip at very reasonable rates in Delhi. You can also book tempo traveller, buses and car with good amenities from tempo traveller rent in Delhi. The distinctive sanctuaries that are secured are kamakshi sanctuary, Amman sanctuary, varadharaja sanctuary, kanchi and numerous such more. The Kanchipuram Tour Packages likewise go for tweaked occasions where the vacationer can have completely happiness regarding this excellent place. The visit bundle would likewise incorporate different things like allow charge, benefit assess and even auto stopping and driver Beta. Along these lines, you would have genuine joy to appreciate the city inside your financial plan. I have seen your blog and your blog is very amazing with lots of useful stuff. Thanks for the sharing!